Join the Kansas Farmers Union Board of Directors as it holds its quarterly meeting and reviews proposed bylaw changes prior to the General Session. During the General Session, members nominate board candidates and national convention delegates, receive a report on organization finances, and begin drafting 2018 KFU Policy. KFU has a rich history of working to protect and promote the interests of family farmers and ranchers by taking a leadership role in advocating for farming, ranching and agricultural interests across the state. Each year, members review past policy, propose and debate new issues, and adopt policy for the coming year. 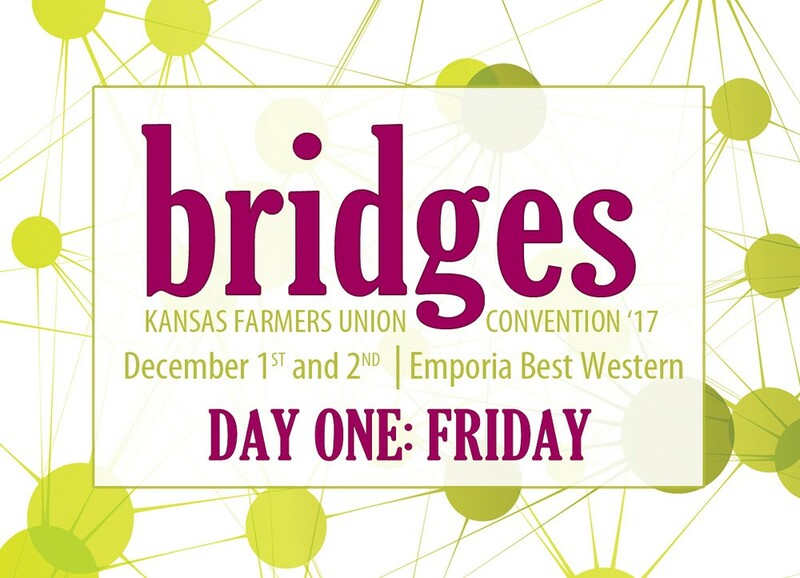 Following lunch, Sarah Green introduces the theme of Farmers, Bridges and Kansas, and Jason Schmidt shares ways he’s built bridges between idealism and practicality. Kurt and Andi Dale dive into how they’ve worked across generations on their family farm in Southwest Kansas. Matt Perdue, National Farmers Union, delivers an update from Washington D.C. about national farm policy and how the organization is building its own bridges. Wrapping up the day, Erika Nelson presents Make Art, Not War exploring a rich array of protest art – art made to draw attention to a topic of great concern in hope of eliciting change or expanding the conversation. KFU staff will be located in the courtyard for check-in and registration. President Donn Teske welcomes members and guests. Sarah discusses the focus of this year’s Convention. How can we build bridges between issues we care about and others who might disagree? How can we build bridges within ourselves to make progress? A story of what happens when a philosophical quest for environmental stewardship meets the current reality of agriculture in Kansas. Convention attendees have an opportunity to talk about how Jason’s story might impact their own work, and time to discuss action steps they can take when they get home. The Dales share their story about how they have been able to work across generations to keep the work going on their family farm in Southwest Kansas. Convention attendees have an opportunity to talk about how the Dales’ story might impact their own work, and time to discuss action steps they can take when they get home. 2017 has been an eventful year across Farmers Union’s policy priorities. Health care and tax reform have garnered national attention, and the renegotiation of NAFTA has raised a number of questions for the agricultural community. Meanwhile, conversations around the 2018 Farm Bill are well underway. This session will offer an update from Washington, D.C., on national policy issues that affect family farmers and ranchers. Erika Nelson, an artist and educator based in Lucas, Kansas, will deliver a presentation about Kansans using art to express their opinions while pursuing the greater good – in other words, using art as a bridge-building tool. From John Steuart Curry’s depiction of John Brown at the Kansas Statehouse to M.T. Liggett’s politically charged fence-line sculptures, protest art in Kansas is at times humorous, sometimes biting, and often clever. This presentation is made possible by the Kansas Humanities Council.